LTD Fender Eliminator with pivot mounted license plate, flush mounted turn signals, and LED license light. Heat shield cover plate also included. Rear mounted Fender Eliminator Kit. 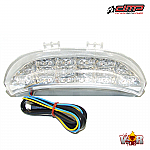 Retains stock signals and license light.